This 35mm. 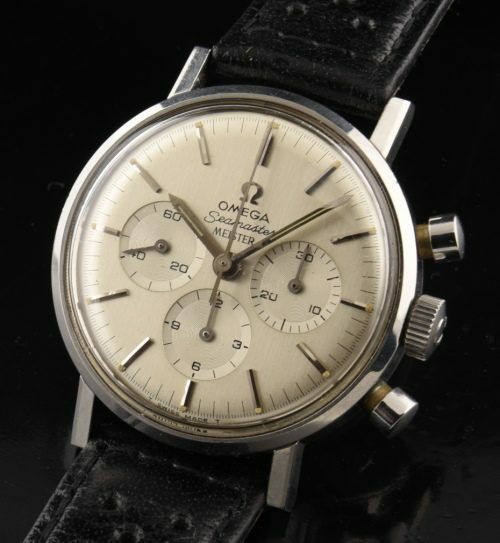 OMEGA SEAMASTER chronograph dating to 1965 is a gem. This is a rare watch, having an original “MEISTER” signed dial (60’s-70’s European retailer). The hands are original. The fine caliber 321 movement was cleaned and is accurate with all chronograph functions operating smoothly. The original winding crown and pushers are present. This is a very desirable vintage OMEGA that is sure to escalate in value.